Pictured, from left, are Kathy Hamman and Sabrina Brown representing the NOON Optimist Club; followed by Ann Zydek accepting the check for the Warsaw Community Library; and John Skeel representing the NOON Optimist Club. 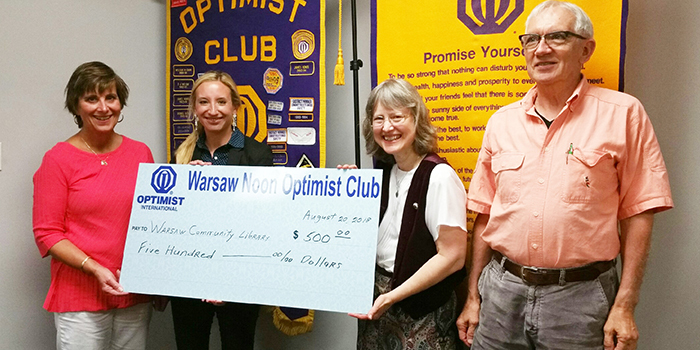 WARSAW — The Warsaw NOON Optimist Club donated $500 to the Warsaw Public Library recently. Join the NOON Optimist Club any Monday at the Grace College cafeteria in Alpha Hall at noon, or visit WarsawNoonOptimist.org for more information.